Josephine Pollard (b.1834), Buffalo Electrotype and Engraving Co., Buffalo, N.Y.
Josephine Pollard was born in New York City, one of seven children of an architect and his wife. She attended the Springler Institute, an exclusive girls' school. She was a devout Presbyterian and worked as an editor for the Sunday School Times and the Methodist Book Concern, and published more than 100 hymns. Her poetry was published in a number of magazines, including Harper’s and Scribner’s, and in the New York Ledger. 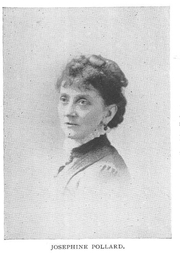 Some of her children’s poetry was collected in a volume called Elfin in 1882. She also wrote for children’s magazines of the era such as The Little Corporal. She wrote several very basic, one-syllable history books for children in the 1880s, as well as numerous children's Bible stories. She was a founding member of the professional women’s club Sorosis. Josephine Pollard is currently considered a "single author." If one or more works are by a distinct, homonymous authors, go ahead and split the author. Josephine Pollard is composed of 2 names. You can examine and separate out names.